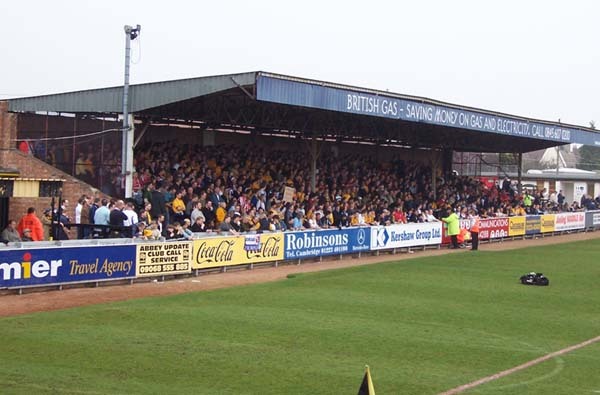 Walking out onto the Habbin Terrace, it can be felt straight away. 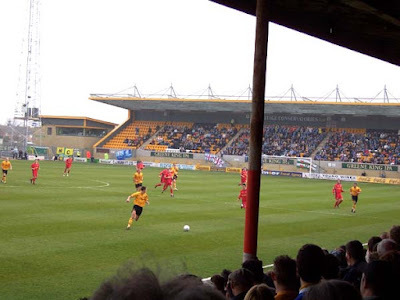 A heady atmosphere cascades like ceiling sprinklers, dampening the raging flame of potential expiration that threatens to engulf Cambridge United. Today will not see it put out though, the fight will need to continue beyond these 90 minutes. Expect it to be fought until the last. Financial troubles may threaten to take their club, but the spirit of the loyal fans never drains away as quickly as ill-spent cash. Today is the day they open up their struggle to outsiders. A Fans United day where supporters of all hues are invited to come together and add much needed moolah to the gate receipts, as well as generally show solidarity with their brothers and sisters in football. It’s a utopian vision but this, to me, is what football should be about. Too often it is an agent of division when it could and should be a catalyst for unison. Tribalism ain’t pretty, nor particularly useful, seems to me anyhow. Certainly you’d like to think everyone who has come to the Abbey Stadium today does so with pure intent, rather than to ghoulishly gawp at a club potentially on its last legs. Can I claim though that my motives for attending were entirely altruistic? Of course not, and for several reasons. Firstly, having developed a thing for, err…, stadium appreciation, during my exile from WLP it is an opportunity to add to the ever-growing list of clubs visited. By the way, I realise that my euphemism used there is a bit like a trainspotter rebranding themselves ‘locomotive number enthusiast’, and similarly fails to disguise the obsessional trait that is intrinsic to these behaviours. Beats vegging in front of the telly though (he said by way of weak defence). Secondly, it gives me a chance to hook up with a pal of mine, now resident in Cambridge, that I’ve not seen for a couple of years. Thirdly, if the ego ever needs a shot in the arm, you have got to come to these things prominently displaying your ‘neutral’ colours. It is the equivalent of wearing a big sign round your neck reading ‘Love Me. I’M HELPING YOU!’, a neon arrow flickering beneath your chin, pointing the way to your empathic mush. Finally, the atmosphere, as I have hinted above, is always pretty special at these events. Today really is no exception, the air full of hope and made extra vivid by the rainbow of colours dotted around. It helps if the home side win the game on these occasions, particularly if they have withstood some hectic pressure before the end. Today’s game lives up to billing, and I even found myself joining in with chants of ‘Yelloooows’ and ‘Iwwwwwwan’. It is very easy to get wrapped up in the emotions of others. Certainly Iwan Roberts deserved the acclaim, scoring what was to be the winner in the 38th minute with a typically deft curled flick through the tightest of gaps between keeper’s paw and post. This came after Tesfaye Bramble's amazing 25 yard dipping effort, Wycombe’s stubborn ping-pong-in-the-box equaliser 5 minutes later and prior to the expected battering during the second half, in the latter stages of which the bar rescues both sides. Talking of atmosphere, it is also notable that Steve Claridge’s entrance into the game in the second half for Wycombe is met with even greater acclaim from the Cambridge sides of the ground than from his own fans. 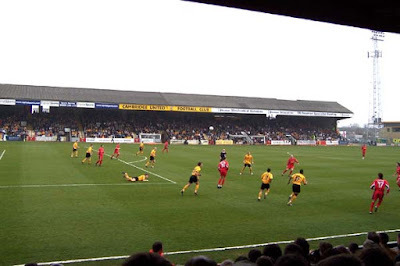 The memories of their flirtation with promotion to the inaugural Premiership 13 years ago, during which Claridge led the attack, is still vivid in the collective memory of the U’s. Sadly it is in stark contrast to their current position at the foot of the Football League, 6 points adrift despite today’s win. Bearing in mind the 4 reasons listed above for non-altruistic action, when the call came at half time for all those in neutral colours to assemble on the pitch for a group photo, I was in two minds as to whether to go, feeling slightly like a fraud. After all, it’s easy for me to take time out from watching my regular team as, being an exile, I sadly so rarely do. Had I still been resident in Bedhampton, it may well have been a different story. Although I wouldn’t think twice, after today, about hooking up with the Fans United ranks again. I eventually decided to join in the pitch party, if only to make sure Havant & Waterlooville FC were visible amongst the more recognisable names. I did feel a tad underdressed though as while nearly all the others were sporting a shirt, I was making do with just a scarf. To explain, I no longer own a H&W shirt, having donated all my sporting jerseys to a charity that dishes them out to underprivileged kids abroad for whom to own a strip would be a significant morale boost. I can’t help thinking though that, however impoverished or malnourished they might be, with their mates running about in Arsenal and Man United livery, the kid who ends up swimming in my XL gold Hawk away shirt might consider themselves to have drawn the short straw somewhat. Again though this distribution of my old gear was not fully without self-motive as I had realised that wearing replica shirts does make me look a little misshapen or, in more gritty parlance, a bit of a lumpy tw*t.
So anyway, there I am walking the perimeter of the Abbey Stadium back and forth from the photo shoot with guys from Brighton, Sunderland, Plymouth, Newcastle, Doncaster, Ipswich, Norwich, Notts County, too may to list really (although the Cambridge Fans United page has given it a stab), and we’re being given a standing ovation. I’ll admit it brought a lump to my throat, even though I did feel as though I, in particular, didn’t really deserve the praise. However, just to see what it felt like, I did the old hands-above-head clap back, to acknowledge their appreciation and their efforts in keeping their football team alive. Of course, it was nice to receive terrace affection rather than give it, but it was certainly a very humbling experience, really. I imagine I looked a little sheepish, although most of the Cambridge supporters likely didn’t notice as they tried to work out who the hell HWFC were. A couple of guys shook my hand, while another asked which team I followed, before offering his heartfelt thanks. While it was a long old day out (beginning with a 4:15am alarm on Saturday morning and ending back in Liverpool 26 hours later on the overnight coach from London), I’m not sure my £18 across match ticket, merch and the change thrown in the bin will do much to cover their financial problems. Hopefully though all the extra coinage created by we ‘foreigners’ are enough to get a decent acorn planted. No club should be allowed to fade out. So for a day, I was a Cambridge United fan, they won and earnt a few quid. Ideal. Then the text came through saying the Hawks had won 2-1 against Eastbourne. Back to the day job and idealerer still. Just come across this... Thanks for your support on that day. I hope you make it to The Abbey again another time.